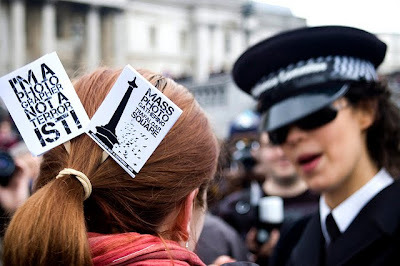 August 4, 2010 /PN/ Freelance photographer Carmen Valino was on assignment from weekly newspaper the Hackney Gazette Saturday when she was threatened with arrest and forced to delete images by police officers at the scene of a shooting in Hackney, East London. Mass Photo Gathering, Trafalgar Square, London in support of photographers' rights. Despite identifying herself as a press photographer, Valino claims the police sergeant told her that she was disrupting a police investigation and ordered her to hand over her camera. She protested about handing her camera over, saying she was in public space outside the police cordon, but he grabbed her wrist and pulled out his handcuffs. The sergeant took her camera for five minutes before returning it and told Valino to delete the images she had taken. He then told her she could return later to photograph the scene. The National Union of Journalists has criticized police following the incident, with general secretary Jeremy Dear saying officers should not abuse the law. He said: "The abuse of the law must stop. There is a gulf between photographers' legal rights and the current practices of individual police officers. "The police should uphold the law, not abuse it - photographers acting in the public interest deserve better." A statement released by police to the Amateur Photographer reads: "Hackney Police is aware of the incident and is currently looking into the circumstances. "It is clearly not the intention of the MPS to prevent people taking photographs. Our officers do receive guidance around the issue of photography through briefings and internal communications and we continue to drive this work forward. "It is therefore disappointing when this guidance in not followed correctly." Speaking to the British Journal of Photography, a Hackney Police spokeswoman confirms the incident and adds that it was "clearly not the intention of the MPS to prevent people from taking photographs. "Our officers do receive guidance around the issue of photography through briefings and internal communication and we continue to drive this work forward. It is therefore disappointing when this guidance is not followed correctly. Any allegations or complaints about police treatment of photographers is taken very seriously and will be dealt with appropriately. Anyone who is unhappy with the actions of individual police officers can make a formal complaint, which will be thoroughly investigated." the Hackney Police spokeswoman added. Is no big deal i have it before same story but at my laptop i do PhotoRescue and my pictures are back and use it for the news paper i have deliver and publish. so no talk and just delete they cant see images on you camera so they will not arrest you ! They are to stupid to understand this. Yes that's a good way around it, and many of us are using it but it IS a big deal, it is a threat to freedom of speech and represents the thin end of the wedge - infringement of our right to make photos needs to be dealt with now before it goes any further. the stop-and-search powers under section 44 of the terrorism act 2000 have been ruled illegal by the european court of human rights! all british photographers should know that and stand up for their rights. How often in the past has this been done for the sake of hiding what may appear to those inside the barrier tape to be police misconduct in a crime? Not saying it was this time, just not unknown. because of the terrorism we live with some things are classified documents. it depends on what the subject is about. I have some great photos of a training exercise but the photos are classified. Can't post them any where not even for school or who the photos was taken for. If the photography was illegal to delete the images would be a criminal offence in itself as evidence was being destroyed, in any event if the images were simply deleted the could be resurrected using card recovery software.